Browse: Home / fwgen – A small management framework to simplify the management of ip(6)tables based firewall. fwgen is a small management framework to simplify the management of ip(6)tables based firewalls, that also integrates ipset support and zones in a non-restrictive way. It is not an abstraction layer of the iptables syntax, so you still need to understand how to write iptables rules and how packets are processed through the iptables chains. This is the intended project scope to ensure all existing functionality is made available. fwgen does however help you create an efficient ruleset with very little effort. fwgen is mainly targeted towards network gateways and hosts which are configured via configuration management systems, often with multiple interfaces and complex rulesets that very fast gets unmanagable or inefficient if not done right. It may not be worth the effort to install it if you just have a simple server where you want to allow a couple of incoming ports. 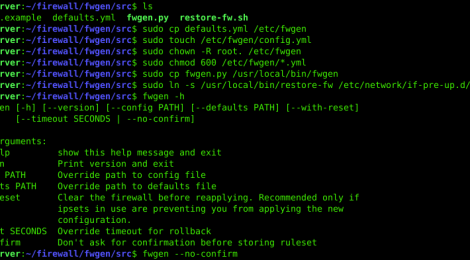 – Separation of duties between the loading of firewall rules at boot/ifup (restore-fw) and the rule generation (fwgen). No complex code are executed during boot/ifup. – Firewall operations are atomic. It either applies correctly or not, without flushing your existing ruleset, potentially leaving you temporarily exposed. However, ipsets are currently flushed for a very short period to enforce concistency with your configuration. – Automatic rollback to previous ruleset if not confirmed when applying rulesets in case something goes wrong. This can be disabled if run automatically by configuration management systems etc. – Namespace support. If executed in a namespace it automatically stores the rulesets in /etc/netns/<namespace>/ instead of in the global namespace. ← avpass – Tool for leaking and bypassing Android malware detection system.